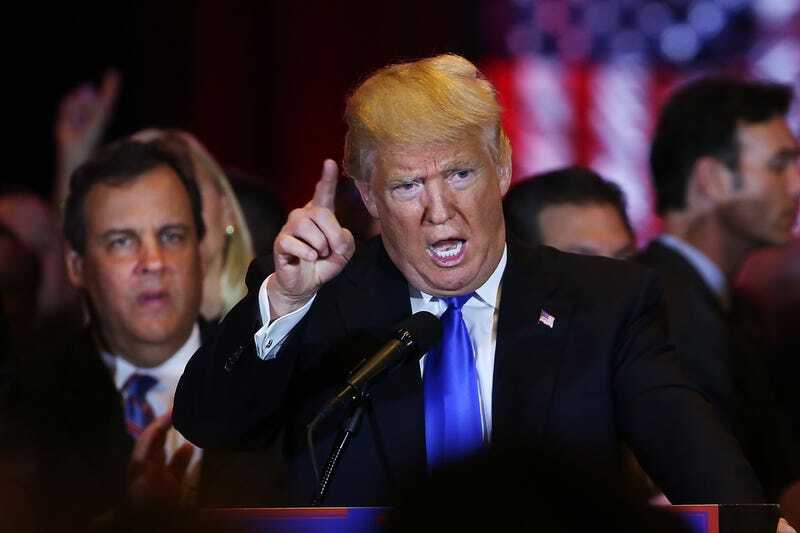 Chris Christie Looks So Dead Inside Because Donald Trump Ate His Brain, Right? I am so very, very grateful for Mary Pat Christie’s discerning and exemplary eye-roll during orange hungry hungry hippo Donald Trump’s most recent speech, which he made after his latest GOP primary five-state sweep. But I am almost concerned for her husband, New Jersey Governor Chris Christie, whose lightless, deadened eyes seem to only follow Trump’s finger. This leads me to believe that either a) Trump keeps Christie’s brain in a jar in the basement of Trump Tower, which I previously proposed, or b) Trump has actually consumed Christie’s brain, in some sort of strivance for a Buffy the Vampire Slayer sub-plot. I’m guessing it may or may not be too late to save Christie, but for the love of Claude, can someone please verify what is going on? End note: throw your shade, Mary Pat!